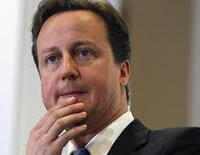 The news of Cameron’s move has reached Palestinians in refugee camps, people whose land is under the control of the JNF. Salah Ajarma in Bethlehem’s Aida Refugee Camp was “delighted to hear the news that the British Prime Minister has decided to withdraw his support for this sinister organisation involved in ethnic cleansing. My village, Ajjur, was taken by force from my family and given to the JNF who used money from JNF UK to plant the British Park on its ruins. For the Palestinians who were evicted from their villages and have been prevented from returning, Cameron’s withdrawal is another victory on the road to achieving justice and freedom for the Palestinians”. The JNF chairman Samuel Hayek defends the work of the organisation saying, “for over 100 years we have had one mission: to settle and develop the Land of Israel” as pioneers of the “historic Zionist dream”. The registered charity claims their work, especially in the Negev region of Israel, deals with “the rising demographic challenges faced by Israel”. In recent months the JNF’s activities in the Negev have received extensive international media coverage, linking them to the demolition of Palestinian Bedouin villages and confiscation of the land of the village. Campaigners report that “even Israeli courts have criticised the JNF as an organisation that discriminates against non-Jews and there is mounting evidence of the JNF’s involvement in Israel’s programme to change the ethnic composition of areas inside 1948 Israel as well as in Jerusalem and the Occupied Territories. It is not acceptable that such an organisation is allowed to operate in the UK, much less to enjoy charity status”. Pressure has been mounting on Cameron and the JNF. An Early Day Motion in the Westminster Parliament highlighted the Prime Minister’s status as honorary patron and claimed that “there is just cause to consider revocation of the JNF’s charitable status in the UK”. UK and international JNF fund-raising events increasingly face protests due, campaigners argue, to “a shift in public opinion on Israel generally”. In 2007, the American JNF application for consultative status on a key UN committee was rejected because delegates were unable to distinguish between the activities of the US Branch and those of the JNF in Israel whose activities the UN’s Committee on the Elimination of Racial Discrimination expressed concerns about. The Stop the JNF Campaign has workshops planned in London on 4 June 2011 and protests against JNF fundraising activities will be organised throughout the coming year. the destruction of the natural environment. The JNF continues to serve as a global fundraiser for Israeli ethnic cleansing, occupation and apartheid. Despite its role in a State institution of Israel (the Israel Land Authority) and in institutionalized racism and apartheid, the JNF and its affiliate organizations enjoy charitable status in over 50 countries. Following the formation of the Coalition Government last year, a review was undertaken of all the organisations and charities the Prime Minister was associated with. As a result of this review, the Prime Minister stepped down from a number of charities – this included the JNF. A full list of all the charities and organisations the Prime Minister and Mrs Cameron are associated with is published on the Cabinet Office website.